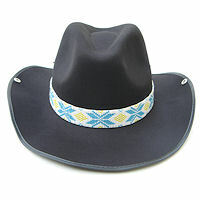 This hand beaded hat band is turquoise, yellow, and white. The beaded part is 19" long by 1" wide(48.26 x 2.54 cm) and it is 43" (109.22cm) overall in length, including the leather ties. Cut the ties to fit any hat, or use it as a belt. Fits up to 40" waist (1.016m).